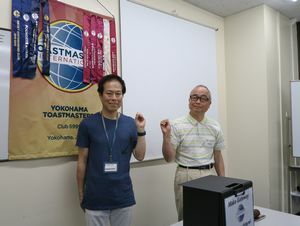 The meeting #622 was held on June 18th at Hatobakaikan. 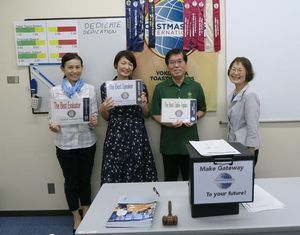 That was the last meeting under President Nakanishi in this term. 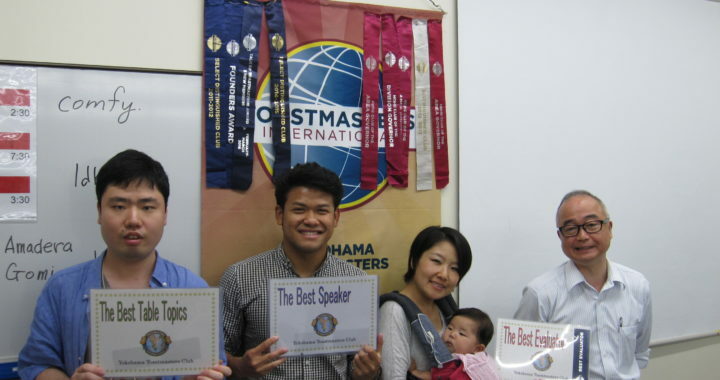 The theme of this meeting, “What did you achieve in this term ?”. And Word of the Day presented to use in the meeting, “Dedicate/Dedication”. *Joke conducted by TM G was great fun and everyone laughed a lot. *Table Topic by TM F was a two-alternative question. ability to communicate with animals ? Each question was pleased and fantastic and was easily answered. Three speeches were all wonderful. TM H made a nice debut talking about herself before an audience. *Evaluation by TM N ran smoothly. Thank you all participants and all role takers ! 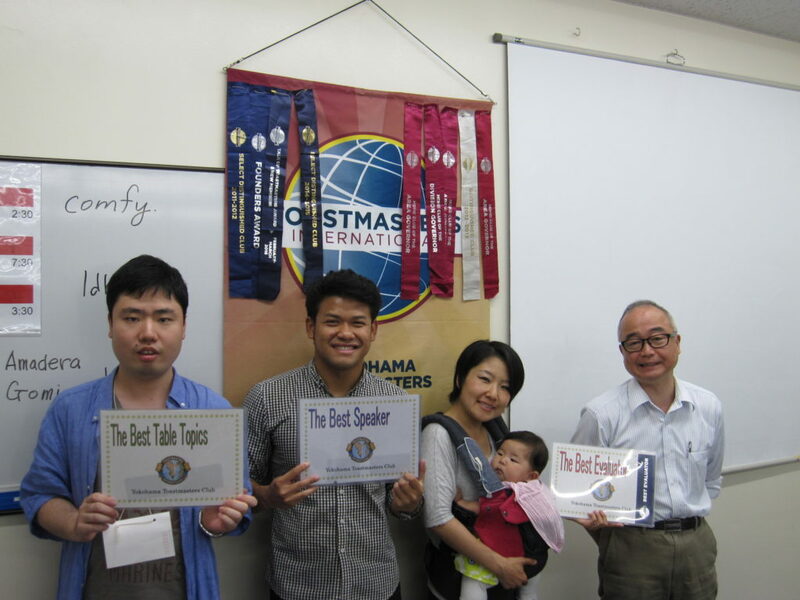 President N and All Officers, thank you for dedicating to Yokohama TMC! I was very pleased as well as honored to serve as TMOD in the last meeting. The meeting theme was little bit difficult. Though, role takers answered meaningful comments. In this half of year, I lost my parents. Members message encouraged me. Of course, role takers performance were so wonderful. and General Evaluation was excellent. Answers for theme are following. “No I don’t. Because I think eternal life seems boring. 2.I don’t want to be. Because if I have the eternal youth and immortality, only I will stay young while my friends and family are getting old. Even my son will become older than me. It’s unacceptable for me! 3.My answer for this question is “NO”. It must be sad if I lived forever without my family and friends. However if all people could be eternal youth and immortality, I also want to be it together! 4.I want to know until when I can live. Because, before I say good bye to this world, I want to say “thank you for everything” to all of my family and friends. 5.As a girl, I never like the idea of getting old, and of course living forever is great. However, if I am the only one to survive while my family and friends all pass away, life would be very hard. I will become very lonely and bore to die ( but can not). Therefore, I prefer a normal life as long as I am happy at every moment of it. I wish I have eternal youth and immortality, but I understand it is not realistic. Therefore my substantial aim to my life is to live happily as long as possible. I have been trying to make some physical and mental exercises and will keep on making them as long as I can in order to live happily. I usually go to a fitness club and go for walking for a couple of hours on weekend for keeping my health well. I am trying to use my brain to avoid dementia which may happen to me when I get older. To study English is one of the ways not to deteriorate my brain. As another factor for living a life happily, I believe we need a certain objectives and a kind of self-satisfaction to our life. I am thinking of contributing to the society around me to some extent as one of my objectives after my retirement, for example. If it is applicable only me, of course, I want to have eternal youth and immortality.